The days are getting longer and the weather warmer and our swans are preparing for their return migration. Resting for long periods and spending the longer days feeding out in the fields are sure signs that they are gearing themselves up for the 2,500mile journey back to their breeding grounds in the Russian arctic. Thanks to our tagged swans and Sacha’s journey last autumn we now know exactly what they will be facing as they set off again and it is hard not to feel a certain sense of trepidation. But Flight of the Swans has raised awareness all along the flyway for the plight of the Bewick’s so we know people will be looking out for them as they go. At WWT Slimbridge, staff and visitors have enjoyed watching the young cygnets grow from timid babies glued to their parents’ sides into confident, independent youngsters. We have watched their characters develop. One particular youngster has impressed us with his cheeky confidence at feeding times, pushing his way into the best positions and even stalking the feeder. Others we have watched gradually grow in independence as they simply spend less time in their family groups. They look very different too, their feathers are changing from grey to white and their bill patterns are beginning to develop. So we hope we will be able to recognise them when they return in the autumn. Whilst the swans have been resting and preparing for the return journey the Flight of the Swans team and their partners across the flyway have been tirelessly working to put some of what was learnt on the expedition into action. 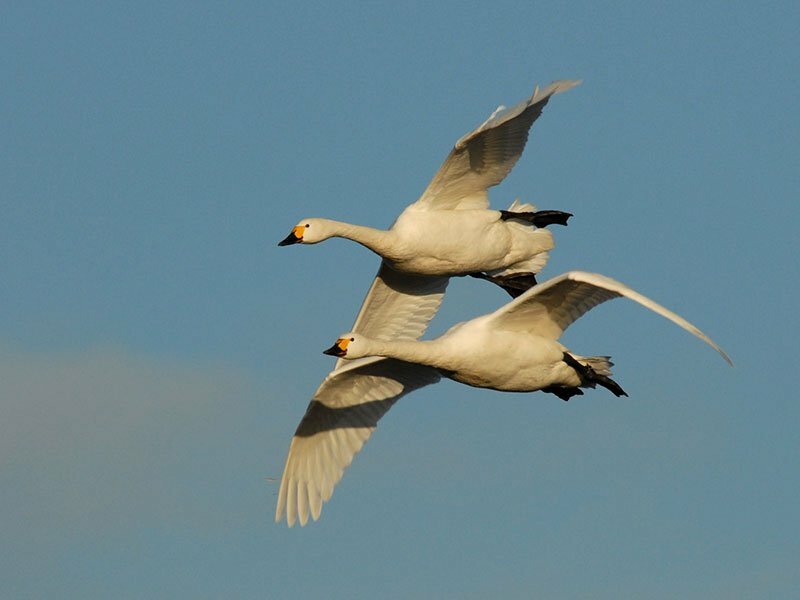 As the swans take to the skies again WWT will be producing ID guides to help people identify the Bewick’s swan. One of the key findings of the expedition was that people don’t know how to identify one swan from another, or even know that there is more than one type of swan. The simple guides will be available online and will be shared by partners in more remote communities. Sacha was struck that everywhere she visited people simply weren’t aware that the small swans – the Bewick’s swans – are a different species. “As soon as people found out and heard that they are in trouble, they wanted to know what they could do to help,” she says. “It seems like a small a thing but multiplied across 11 countries, 4,500km and millions of people, one small change could make the difference. And if it can, it’s worth trying,” she added. A network of swan champions among people living and working in the remote Arctic, who Sacha met while crossing the tundra. Information on swans included with hunting licenses issued in the Arkhangelsk region of Russia. A collaboration between Danish and Polish hunting groups to trial the use of alternatives to toxic lead shot, as used in Denmark, that will be shared across other countries. A collaboration between carp pond managers and conservationists in Poland to manage the ponds to benefit the swans as they pass through on migration. A charter agreed by paramotorists and conservationists in Belgium, so that paramotorists can enjoy wetlands without disturbing birds at crucial times of the year. This is a model that can be implemented in other areas where human activity comes into conflict with the swans.